Now that I'm with the National Library (office is at the NL building, Victoria Street), I get to see all the exhibitions that have been put up for the public. I also thought I should 'archive' them or at least have a simple pictorial record that they once existed. Hence this blog post. 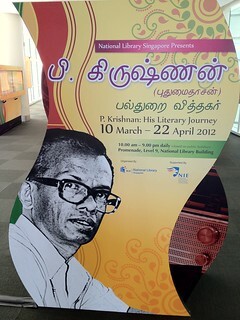 Here's an exhibition that will end on 22 Apr, 2012: "P. Krishnan: His literary Journey". 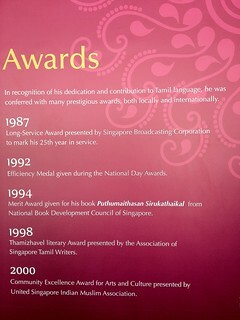 P. Krishnan is one of Singapore’s illustrious Literary Pioneers who writes under the pseudonym of Puthumaithasan. 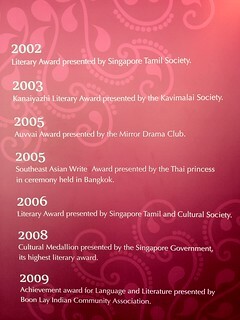 Focusing on social issues, his writings are peppered with a tinge of sarcasm and a dash of comedy. 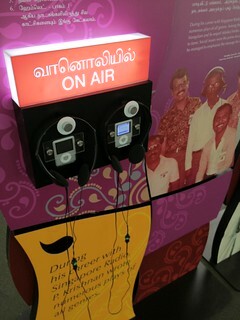 Visitors to this exhibition will have a chance to listen to excerpts of his famous radio play “Adukkuveetu Annasamy”, about life in the HDB heartlands as well as view excerpts from the Tamil adaptation of the TV drama, Macbeth. 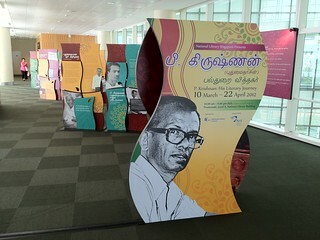 This showcase is an opportunity for the younger generation to know about this pioneer and appreciate his contributions to Singapore Tamil literature. I suppose it was this tweet that made me remember a particular childhood episode, when I was around 10 years old. Remembering about my father and a period where he seemed to viciously cane me for the slightest reason. My father used the thin rattan cane (the defacto tool of corporal discipline Asian parents used at that generation). It wasn't just "tough parental love", for the frequency of me being caned was almost daily. My younger brother and sister were spared mostly, I recalled. I can't remember how long that caning went. I'm not sure when it stopped. I still recall pretending to be asleep when I heard my father come home. So that he won't find an excuse to cane me. The caning was serious enough to break skin, result in bleeding and noticeable welts. Bad enough that my mum had to apply some ointment to cover up the broken skin. I would go to school with visible cane marks. When I was 10, my father was in his 40s (he was considered to have married late, for his generation). My father was a strong man. And it didn't help that I was an emotionally sensitive child. At 10 years old, I once even thought of ending my life just to spite him. My father seemed to have focused his anger on me. I was not naughty as a child at all. I attended school, came straight home, did my homework, never talked back to my elders (kids my generation were spoken of, but not spoken to). OK I cant say I was a perfect child, but I was far from being a bad one. In truth, my father was not a cruel man. He was generous to his friends, our neighbours, and our relatives. Maybe that was why it hurt me, in more than the physical sense. The 10 year old me never understood why he couldn't be generous and forgiving to his own firstborn. There were negative consequences, in that I deliberately became a very morose and serious child. I remember "experimenting" with not saying anything to my father for days. Days became weeks. And then it became natural. 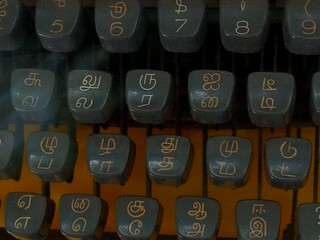 In my teenage years, that refusal to talk to my father (other than functional statements) became little rebellious acts. Part of it was the teen angst and the onset of hormonal changes. One time, it occured to me why young lions were chased out of the pride. They would otherwise kill the top male lion, their sire, because there was no room to maneuvour. My father and I didn't have a destructive relationship but we were never close. I knew he tried to be better towards me, and there was an episode where I was very gateful to him for supporting my contiuning education. But even so, my feelings towards him never quite swung completely towards the good. There was always that shadow of resentment. It took decades before those childhood scars could truly start healing. 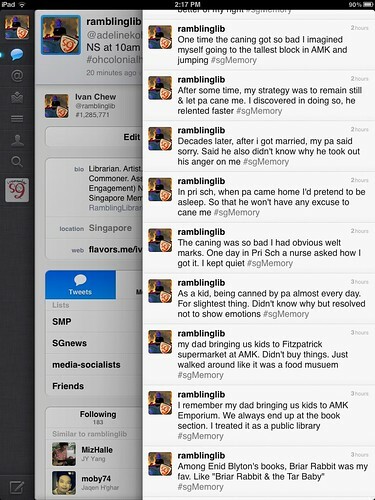 One poignant point was when my father said something close to an apology for that childhood caning episode. A self-admission. 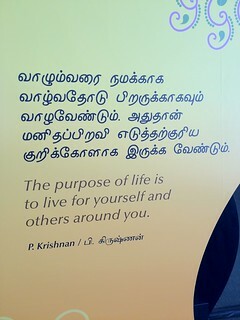 I was with my wife and my parents, at a hawker centre eating desserts. My parents were in their 60s by then. I had moved out of my parent's apartment after getting married. It was a home visit with my wife. We talked about how some things had changed, or remained the same, in the neighbourhood. My father started sharing, with my wife, how I was as a child: that I liked to draw and read. He remembered that I was a good boy, even as a toddler. Out of the blue, he said how at one point he would come home and cane me for any reason. He was not sure why he was that angry. A part of him knew he had been too harsh. And yet he could not stop himself and he continued to take his anger out on me. He recalled not caning me only when he saw me asleep (when I heard that, I had goosebumps -- and I also secretly congratulated myself for displaying some smarts as a 10 year old). With his relevation, or confession even, there came an awkward pause. There was my father, sounding apologetic. All my life, I've not seen that side of him. I looked at my wife. I looked anywhere except at my father. I said nothing then, or after. I guess this is my way of saying it now. P.S. Perhaps to you reading this, I'm making a mountain out of a molehill. 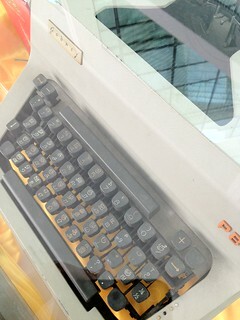 Strange that I cannot speak of this with my father now. All I can say is that the resentment has been real for much of my life. It's not so traumatic that I can't talk about it. I just can't talk to my father of it. Or won't. In truth, there is cowardice and irrational fear at work. I fear that I would cry, and he would cry. 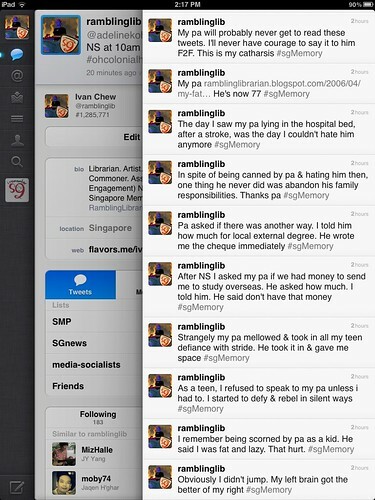 Or maybe it all doesn't matter now, and I'm merely post this to share a (good) story. Whatever it is, it's been enough that I know my father knows. And vice versa. That's as good as I wish for things to be.